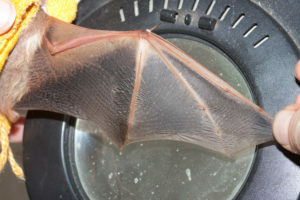 A beautiful red bat’s wing. It’s hard to mimic nature, because design is driven by necessity. It will be interesting to see how close the experimental design gets to ‘real’ bat capability. 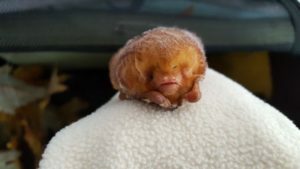 A lovely red bat, to whom the wing at left belongs! Photo by Kim O’Keefe. Hi everyone! I hope you all had a good week! I was home sick all week, so I didn’t really do much. I read an article about a new study being worked on by engineers at the University of British Columbia. The researchers are studying bat flight to help them develop better drones and other aerial vehicles. First the engineers built an aluminum bat wing and putting it in a wind tunnel. They then made a 3D computer model of the wing. They are studying how air flow affects the way a bat flies. Next, the engineers will make a physical model of a bat. This model will be used to study a bat in motion. Information learned will be used to optimize drone flight. They are hoping to make drones that will fly like automated bats with flapping wings. Groups of drones will be able to fly in a flock and will be used by businesses and emergency response.